Karim Benzema was featuring in the vital clash against bitter rivals Barcelona in the second leg of Copa Del Rey Semi finals at the Santiago Bernabeu last night. The 31 year old French striker has found his scoring boots this season and is the leader of Real Madrid's attack after the departure of Cristiano Ronaldo. With 20 goals and 4 assists this season, it goes without saying that Benzema is playing a pivotal role for Los Blancos up front. But the clash against bitter rivals didn't go in his or Real Madrid's way as they were sent crashing out of the Copa Del Rey with a 3-0 defeat in their own den. Despite their valiant efforts, Real Madrid were punished in the second half by a more clinical Barcelona in front of goal. Los Blancos forwards failed to take their chances as they were denied by Barcelona goalkeeper, Marc Andre Ter Stegen, on multiple occasions. Luis Suarez scored twice from two chances while the other was an own goal in a 3-0 defeat. While Karim Benzema was busy playing in the Copa Del Rey, it was announced later on that strangers entered the home of Real Madrid striker by in a Spanish football show ' El Chiringuito'. It seems that things got worse for the French forward as the player received news about the activities going at his home just after Los Blancos suffered another loss against their rivals. According to the report, it is unclear what the intruders were able to steal, but this news will surely come as a shock to Benzema. 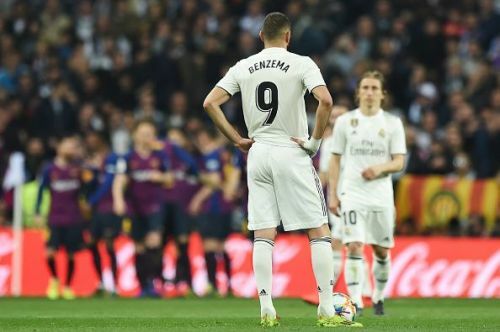 Real Madrid will host Barcelona again this weekend in the La Liga and onus will be on their striker Karim Benzema to avenge their recent defeat.